We stand up. We speak out. We need you. Donate TODAY! We’re at a critical moment; women’s health is increasingly under attack and corporate interests are controlling the agenda. It’s not just that Big Business has influence—they’re running the show these days! The head honchos of corporations now hold key decision-making positions in environmental and public health agencies. That’s why your donation to Breast Cancer Action’s fierce independence is so important. Breast Cancer Action (BCAction) depends on members like you to fund our work. 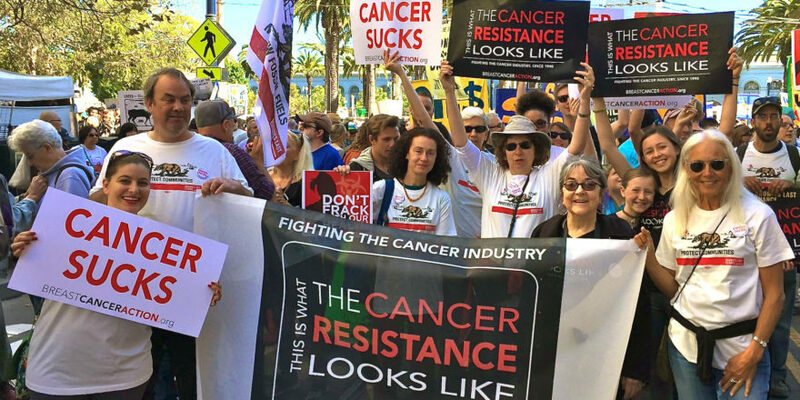 We don’t take money from companies that profit from or contribute to cancer, which means we can’t be silenced. BCAction is an outspoken, truth-telling, rapid response organization— just what you need from an advocacy organization at this critical moment. We stand up. We speak out. Real people are suffering the consequences of terrible policies that put corporate profit before public health. We’ve got a lot of work to do. And with your support, we will push back on this corporate wish-list of deregulations that will gut public health protections. Your generous donation of $25, $50, or more will help us ensure that the health of women living with and at risk of breast cancer won’t be sidelined. We’re fighting for a more just and healthier world—eliminating cancer-causing toxins, ensuring healthcare access for those who need it most, and upholding standards of safety and efficacy for breast cancer treatments. Simply put, our work has broad public health and social justice benefit. Together we are powerful! Please make a donation of $25, $50, or more today. In solidarity and with heartfelt gratitude.